Today December 6th is Finland Independence Day, a very special day when a big fancy party is held at the President's Castle in Helsinki and the Finnish President shakes the hand of thousands of honorable guests. Besides watching the big event on TV, Finns usually prepare special meals and food to celebrate. 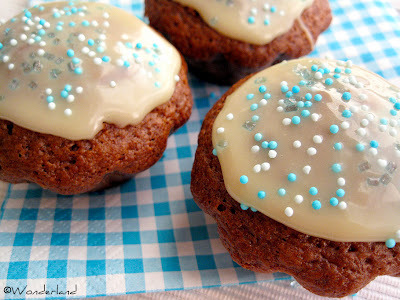 Well... we aren't cooking anything special today, so I thought that it would be a great opportunity to BAKE SOMETHING! They are among the best muffins I've ever made. I chose coffee because Finns are really fond of it, almost as much as Italians, and I added cocoa powder to make them even more yummy! These muffins are made with yogurt. In this case coffee flavoured yogurt of course! I often use yogurt in my muffins because I think that it makes them very moist and gives them a nice fluffy spongy texture. 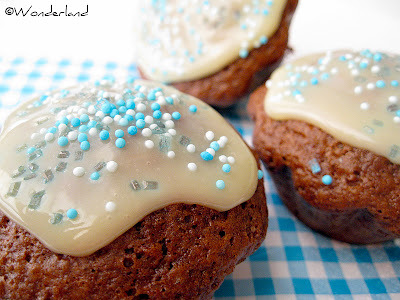 The Coffee Chocolate Muffins are lovely enjoyed as they are, but I decorated them with melted white chocolate and white-blue sugar sprinkles to celebrate Finnish Independence Day. HINT: If you like, you can add some liquor to the batter. I added brandy, and it taste delicious. In a bowl mix the dry ingredients: sifted flour, sugar, sifted cocoa powder, instant coffee, salt, yeast and baking soda. In a second bowl whisk the egg, then add milk always stirring. Add then oil and yogurt (and liquor if you want). Mix well. Add this wet mixture to the dry ingredients. Stir with a rubber spatula just enough to combine everything. Spoon the batter into the prepared muffin tins, for about 2/3. Bake about 15 - 20 minutes or until a toothpick inserted in the center comes out clean. Place on a wire rack to cool for five minutes and then remove muffins from the pan. 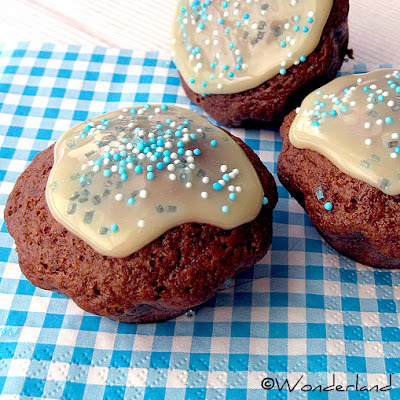 When they've cooled down, you can decorate them with icing sugar or melted chocolate & sprinkles.